Scribes is an ultra minimalist text editor with remote editing,automatic word completion and many more. Remote editing (ftp, sftp, ssh, samba, webdav, webdavs). Automatic word completion,correction and replacement,pair character completion and smart insertion,indentation. Powerful text processing and manipulation functions. Syntax colors for over 30 languages. hit enter and type ubuntu password. then type below command and hit enter. type below command and hit enter. 2.After the successful installation click Applications icon or unity dash from unity launcher. And type scribes in the search applications field. 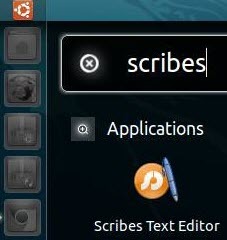 And click scribes text editor.